PCE Ninja Gaiden (JPN) "game end glitch" in 01:23.73 by Bernka & Rum. 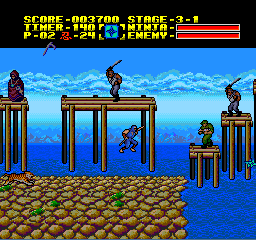 Ninja Gaiden is a port of the popular NES game of the same name with upgraded graphics, different music and many gameplay differences. In this TAS, Bernka and Rum utilize a game-breaking glitch involving corrupting the memory to warp to the end cutscene early.